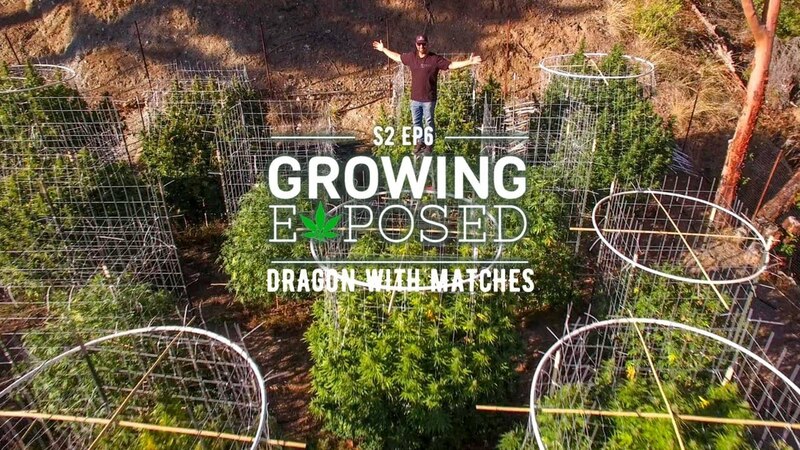 GROWING EXPOSED SEASON 2 EPISODE 6: Dragon With Matches/Royal Gold Soils - Roll A Joint! http://www.growingexposed.com/dragons-with-matches/ . A Guide into the world of marijuana production. Growing Exposed is a hosted television series that documents cannabis garden tours, checking out the latest and greatest in the hydroponic industry. Giving the viewer unprecedented access to the growing list of legal gardens and experts across North America. Presented without commercials for your viewing pleasure! Sponsored by Green Planet Nutrients. Carved into a mountainside… we took a journey up some steep terrain of cliffs and canyons to reach Scarlet Fire Farms to catch up with Brian, who is also known as Dragon with Matches. Brian is a veteran in the industry with two decades under his belt as he has been involved since the early days of growing guerrilla style in the woods. Following the Grateful Dead in New Jersey around the country and ending up in Humboldt County, Brian unknowingly never left this growers paradise. For generations Northern California growers have flocked to this region to work on perfecting the outdoor grow. With their knowledge being passed down and added to over the years it is no surprise that they grow some of the most incredible cannabis in the entire world. “It’s destiny, every day I walk through these things and say holy crap… I’ve taken it to this! !” explains Brian. At Dragon With Matches they go big with their plant growing cannabis in a row crop. A row crop is a crop that can be planted in rows wide enough to be tilled. Here they grow massive outdoor cannabis plants that reach 10 feet tall, or as high as an NBA basket ball hoop. Brian adds that he makes sure that his plants have lots of space and structure. He supports these huge colas by using metal trellis netting that is so strong, Brian demonstrates how he can literally climb up them. The Scarlet Fire Farms tour is led by our veteran tour guide Justin and as usual we get into what sets this farm apart. Brain explains he uses and practices a Korean farming technique that involves using an ancient fermentation process which has been used for centuries. Fermenting cannabis leaves means they are able to re-use all their waste, ensuring it is put right back into the system forming a close loop system. Creating their own nutrients impacts the environment as little as possible. Scarlett Fire is not only the name of the Farm but they also have a variety called Scarlett Fire that Brian bred himself. Durban Poison x Yeti OG. Brian explains “It is a very short Durban Poison” which is great for finishing late September or early October before the rain hits in Humboldt County. We also visit Royal Gold Soils during the episode to take an intimate tour of their facility and learn why quality control is so vital to a consistent, high quality cannabis grower like Scarlett Fire Farms. Manufactured in the heart of Humboldt, Royal Gold is well known for consistent, high quality products loved by both indoor and outdoor growers. Here we meet Micheal, who was nice enough to walk us through the process from start to finish…from the coco arriving straight from India, to how they prevent cross contamination, to the individual batch markers that are imprinted each bag of soil. Royal Gold Soils sets the standards for the industry. Royal Gold creates several products that are coco fibre based. One of those is Tupur. (pronounced two-per) and we get a tour of the entire manufacturing line of this product. It is a blend of coco fibre, aged forest materials, and perlite.